The Quick Rafter Cutter is designed for one operator to safely and easily complete a basic two-sided rafter cut in one operation. Made with high quality, industrial grade parts, the QRC is rugged enough to withstand the rigors of the industry's harshest environments. 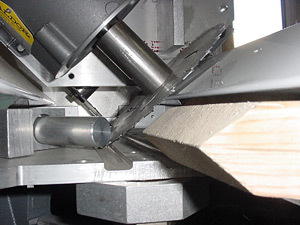 The QRC consists of two, 2 horsepower circular saws mounted on a solid carriage with the blades set at 45 degrees to ensure an accurate angle cut each time. 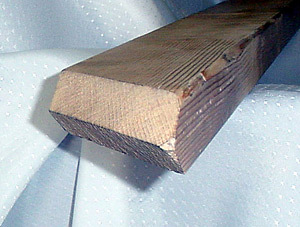 The saw carriage runs along steel rails on a heavy duty bearing assembly to accurately guide the saw blades through the lumber. 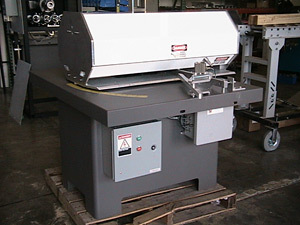 The carriage assembly can be rotated to achieve any desired cutting angle and is held in position with an air brake. To ensure the safety of the operator, the QRC is fully enclosed and the saw blades are only accessible by removing screwed-on safety covers. By incorporating a modular design, the QRC can be serviced quickly and easily using basic tools. 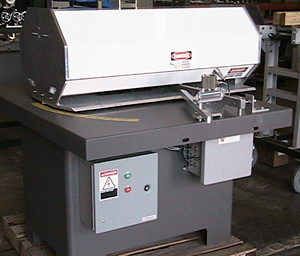 Currently we do not have any refurbished quick rafter cutter machines in stock.